Seriously, though - Gears of War 3 is going to wrap up the trilogy's overarching storyline, according to Epic executive producer Rod Fergusson. Oh, they're leaving the fate of the universe open for future endeavors...but as far as this particular series goes, you can expect some real closure. If that little news tidbit leaves you hankering for more details, we have a barbecue plate of spoilers ready to serve up. 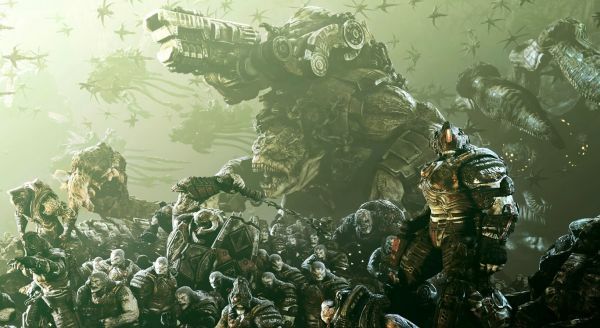 The Gears 3 Achievement list has been leaked, and it provides some hints at some of the campaign's more exciting moments. It also tips us off that there are 10 maps available for Horde and Beast modes, and that a mysterious "Arcade" version of the campaign awaits discovery by a team of co-op COGs. Keep reading to check out a spoiler-free excerpt of co-op specific Achievements. Page created in 0.2758 seconds.